New for the 2016 season is the SprintX Championship for GT competitors. It is based on the very successful Blancpain Sprint Series in Europe. There is a total of six rounds with two races at three different venues (Canadian Tire Motorsport Park, Utah Motorsports Campus and Mazda Raceway Laguna Seca). The events are 60-minutes in length and require a mandatory pit-stop for a driver change between the 25 and 35-minute mark of the race. Grand Touring X (GT-X) – This is the series quickest class and is predominantly cars competing in the FIA GT3 category. Examples of vehicles eligible in this class include: Porsche 911 GT3 R, Nissan GT-R Nismo GT3, Mercedes-Benz SLS AMG GT3, McLaren 650S GT3, Cadillac ATS-V.R GT3 and Ferrari 488 GT3. Grand Touring Sport X (GTS-X) – The cars in this class are similar to the GT vehicles but have more preparation restrictions. In previous years, the GTS class which is the basis for GTS-X was mainly comprised of Ford, Chevrolet and Porsche products. In 2016, this category witnessed the appearance of a number of new vehicles which proved to be very competitive - KTM X-Box GT4, Ginetta G55 GT4 and SIN R1 GT4. These cars are prepared to the same rules as those competing in the 50-minute sprint races. Team points are awarded based on each competitor’s performance during their driving stint. 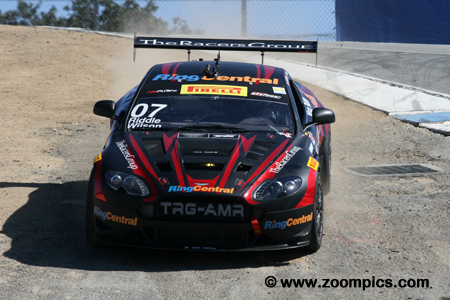 Mazda Raceway Laguna Seca hosted the final rounds of the Pirelli World Challenge Championship. The SprintX class at the Grand Prix of Monterey presented by Nissan had a total of twenty-five entries. Teams would compete in two races for one-hour around the eleven-turn 2.238-mile road course. 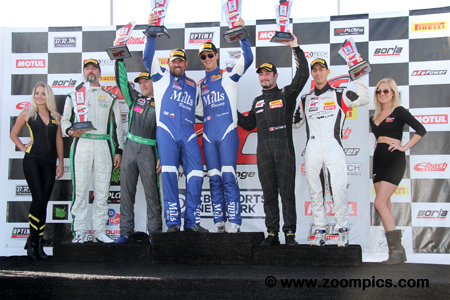 The overall and GT-X class podium at round six - the season’s final SprintX race. To the left are the runner-up’s Tim Pappas and Andy Pilgrim from Black Swan Racing. And, on the right competing in the M1 GT Racing Audi R8 Ultra GT3 are third place finishers – David Ostella and Dion von Moltke. In the center, are the victors and the new GT-X champion, Michael Mills along with his co-driver for the event, John Edwards. In Sunday’s finale, Tim Pappas made a last-lap pass on Michael Mills in the Mills Racing BMW Z4 to be the first competitor at the checkered flag. Unfortunately, Pappas and his teammate Andy Pilgrim driving the Black Swan entered Porsche GT3R were penalized ten seconds after the race for a pit violation. This dropped the pair to a second overall and in the GT-X class. The previous day, the duo finished seventh overall and in class. 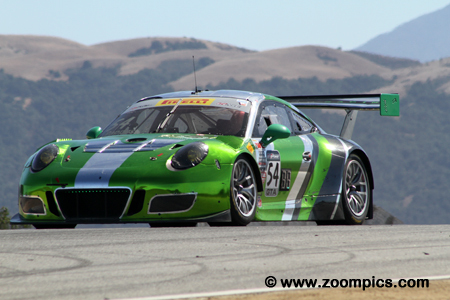 The GT Cup-X category made their first appearance of the season at Mazda Raceway Laguna Seca. It was a small race group with only three entries. 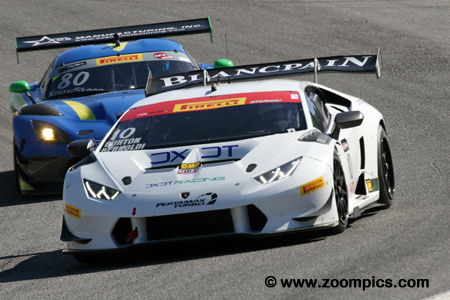 The weekend’s first event was won by the DXDT Racing Lamborghini Huracan Super Trofeo of David Askew and James Burke. Taking the victory in Sunday’s race was their teammates, former MLB player, Jeff Burton and ex-Formula One driver, Enrique Bernoldi in the No. 10 Lamborghini. Sharing the No. 23 Audi R8 Ultra GT3 entered by M1 GT Racing were David Ostella and Dion von Moltke. The duo had a runner-up finish in the previous round at the Utah Motorsports Campus. They started the season’s final weekend by qualifying on the GT-X class and overall pole. In round five, they dropped to an eighth place finish. The following day they earned the last spot on the podium. A split start was used with the GTS-X category starting behind the GT-X and GT Cup-X entries. 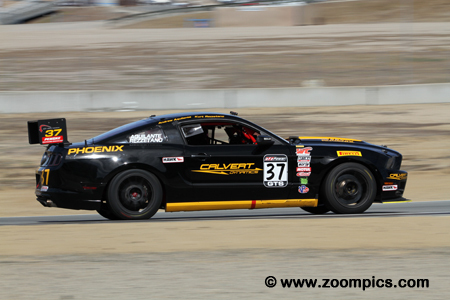 Leading the GTS-X group into turn two during Saturday’s first lap is the Kurt Rezzetano / Andrew Aquilante Ford Boss 302. 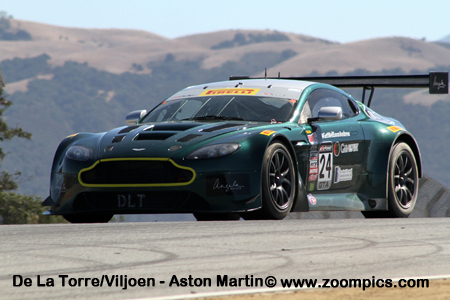 Not far behind, is the TRG-AMG Aston Martin Vantage GT4 shared by round three winners Derek DeBoer and Jason Alexandridis. There was a total of twelve GTS-X entries – the most all season. The No. 37 Calvert Dynamics Ford Boss 302 was driven by Kurt Rezzetano and Andrew Aquilante. The Mazda Raceway Laguna Seca event was their first appearance in the SprintX series but they were no strangers to Pirelli World Challenge competition or the victory podium. They started the weekend by taking the GTS-X class pole and won the final two rounds of the season. Drew Regitz teamed up with Kyle Marcelli in the No. 19 Audi R8 LM GT3. Regitz started the car from fifth on the grid and at the mandatory pit-stop handed the car over to his co-driver in the same position. Marcelli charged and on the penultimate lap passed the Dodge Viper of race leader Mike Skeen. He took the checkered flag by a 1.338-second margin. The team did not start the finale as Regitz had an accident in turn two during the GT race. 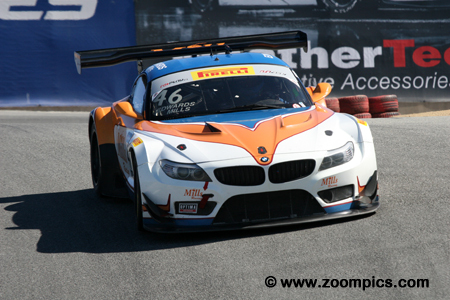 Michael Mills entered all six races of the new SprintX series driving the Mills Racing BMW Z4. He scored two wins in the opening round at Canadian Tire Motorsport Park and took a third victory in the season finale with factory BMW driver, John Edwards. His performance during the season earned him the GT-X driver’s championship. 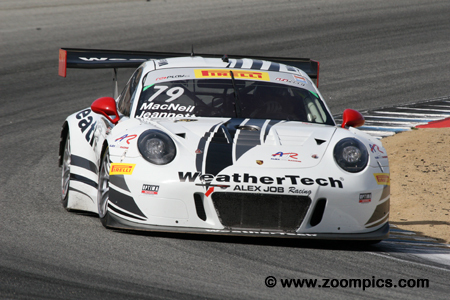 This was Mills second Pirelli World Challenge title – in 2014, Mills won the GTA championship driving a Porsche. IMSA regular, Cooper McNeil, decided to join the Pirelli World Challenge series for the final two race weekends (Sonoma Raceway and Mazda Raceway Laguna Seca) in his Alex Job prepared Porsche 991 GT3 R. He was joined by his teammate Gunner Jeannette. In round five, the pair started second and finished third. An engine failure after twenty-four-laps caused them to retire from Sunday’s race. 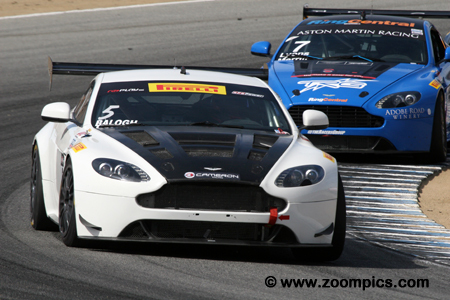 Kevin Buckler’s Racer’s Group entered five Aston Martin Vantages in the GTS-X category. The 07 Aston Martin was the quickest of the squad. It was shared by class point’s leaders Max Riddle and Kris Wilson. Like Mills, they had entered every event and had solid finishes. 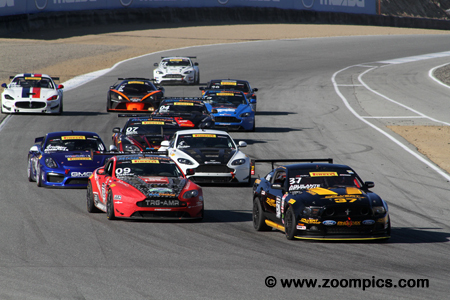 At Mazda Raceway, they started and finished second both days to clinch the GTS-X title. Dan Knox returned to the series with his Dodge Viper GT3-R and was joined by Mike Skeen. 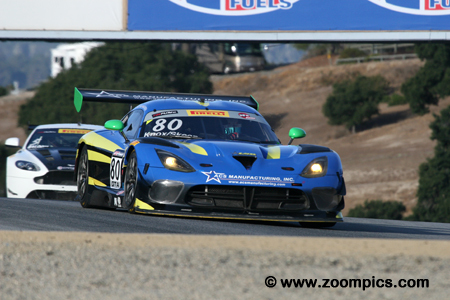 The Viper started ninth but moved up seven positions with Skeen behind the wheel. His drive earned the team the VP Racing Fuels Hard Charger Award and a second place finish. Skeen drove the car in Sunday’s GT event but failed to complete a lap. The crew made repairs and the car appeared on the SprintX grid just before the start but again was unable to turn a lap. 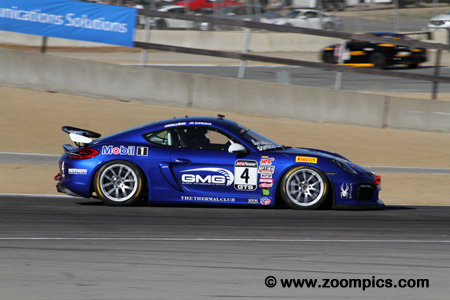 The final event saw James Sofronas and GMG Racing debut a Porsche Clubsport GT4. Sofronas used the car to compete in the GTS division and GTS-X with co-driver Matt Halliday. 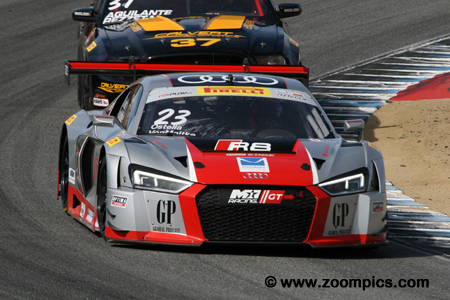 Sofronas and Halliday started Saturday’s race from the fourth grid position in GTS-X. At the checkered flag, they were third in class and finished fourth in GTS-X the following day. 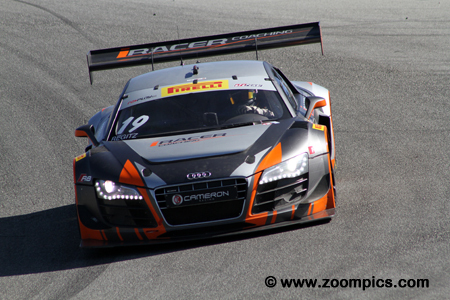 Pirelli World Challenge newcomers, Aristotle Balogh and Greg Liefooghe, drove the No. 5 Aston Martin Vantage GT4 prepared by Stephen Cameron Racing. In Saturday’s race, they were gridded third in the GTS-X class and retired after fourteen laps. The pair rebounded the following day and finished third in class.